In true community fashion, the concept of Kulshan Chorus was conceived in Flip Breskin's living room during a song circle in 1987. The chorus was initially led by founding director, Roger Griffith and accompanied by Karen Fitzgerald. Roger retired in 2013 and the chorus is currently led by Artistic Director Dustin Willetts. The powerful and colorful Kulshan Chorus of Bellingham, Washington is an intergenerational, secular and multicultural choir singing in honor of human diversity. The chorus has sung and celebrated for three decades. Drawing on music from America's vast cultural roots, musical selections include a range of styles and origins. Repertoire spans American folk classics to world music; well-known choral works to new premiers. This eclectic mix brings an awareness and celebration of the world's cultures to both the community of singers and our wider community of audiences. In addition to regular concert seasons, the Kulshan Chorus performs outreach concerts. The chorus has partnered with the Interfaith Coalition, Habitat for Humanity, Sean Humphrey House AIDS Shelter, Whatcom Human Rights Task Force, and local public schools. 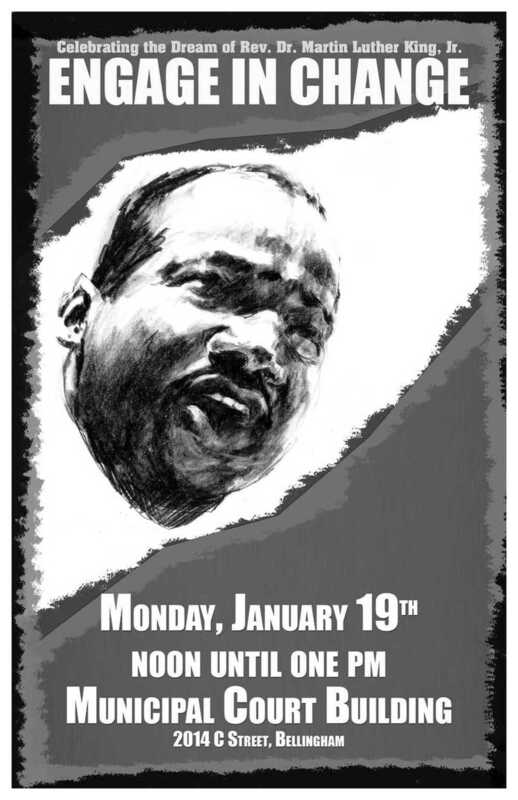 The Chorus has performed at Bellingham's Martin Luther King Jr. celebrations since their inception in honor of his legacy. In 1998 Kulshan Chorus appeared with Judy Collins at the Mt. Baker Theatre. 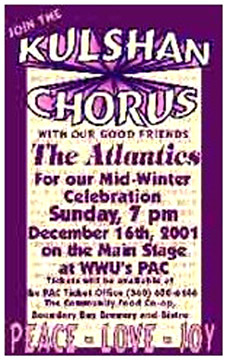 In October 2001, the Chorus joined forces with the Whatcom Community Foundation in a program to honor philanthropy in Whatcom County. The chorus has toured, sharing music with host choirs and musicians in indigenous villages and towns of Ecuador, rural France and Switzerland, Romania, Costa Rica and Croatia. Our staff and pool of musicians maintain a high level of musical excellence. Wherever you are, whether this is your 1st or your 30th Kulshan Chorus concert, we invite you to join us for our winter concert “Gathering” on January 12, 2019 at 7:30 p.m. at the Mount Baker Theatre. This concert will be full of surprises, from guest instrumentalists to immersion in a unique artistic experience. Prior to the event until intermission, there will be a silent auction in the Encore Room of over fifty items, from food to artwork. Come early! Building community and healing divisions is a heartfelt desire for many; for Kulshan Chorus - it is our passion. Through performances and tours, we focus on building strong relationships within our community and around the world. In honor of our 30th year, we want to join together with you, our beloved audience, celebrating the different reasons people come together. Our Artistic Director, Dustin Willetts, has discovered a wide variety of diverse music from a Bollywood favorite to a traditional Roma tavern song—music that will delight you and remind you of the beauty of gathering together. See you at our “Gathering”! 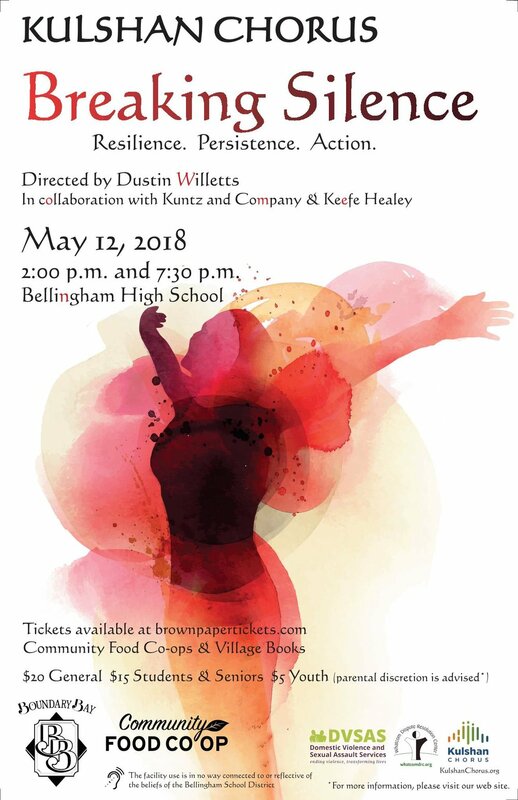 Under the inspiring direction of Dustin Willetts, our 100 voice Kulshan Chorus is excited to present not one but two powerhouse performances of BREAKING SILENCE. While Kulshan Chorus is no stranger to speaking out for social justice, this concert is a first. We have joined forces with the incredible minds of Pam Kuntz (Kuntz and Company) and Keefe Healy to present an artistic representation of the underlying ground of the #MeToo movement. Using the combined artistic pillars of music, dance, and theater - our hero, Miriam, shares her story, the lessons she has learned, and calls upon you, the audience, to rise up. Her story weaves through songs from some of the biggest names in choral composition -Jake Runestad, Moira Smiley and Andrea Ramsey along with insightful pieces from Rag'n'Bone Man and MILCK. Using choreography, spoken word, and stage design all created for this event, Kulshan Chorus proudly presents a collection of 21st century choral pieces that will evoke empathy, resilience, and clarity between right and wrong. For this special concert event, Kulshan Chorus has partnered with two remarkable local support groups DVSAS (Domestic Violence and Sexual Assault Services) and Whatcom Dispute Resolution Center. A portion of the concert proceeds will be dedicated to these two wonderful non-profits. In partnering with DVSAS support personnel will be available on site. Greetings from the 100 voices of Kulshan Chorus! We’re excited to extend a December 16th invitation to you for our Annual Winter Concert, Choosing JOY – a Soul Journey, featuring guest artist: Gary Giles. This season, we explore a wide range of songs from gospel and spiritual traditions throughout history. One of the strongest themes, woven through this evening, is one of Hope. These musical selections stem from contexts of oppression, fear and trial. More importantly, they call for a better life. There isn’t just hope in these songs - there is expectation of something better. Through these insightful pieces you will hear the voices of those under the boot of oppression, whether it’s the suffering of slaves or the cries of women calling for equality; this music calls for change. Not only does it call for change, it demands it - demands that we can do better for everyone. From the classic Elijah Rock to the contemporary Quiet (born of the recent Women’s March) this is music that both challenges and inspires us to rise to a better life. From Sister Act's Joyful Joyful to Elijah Rock, you won’t want to miss this high-energy, vocally rich concert featuring songs from Soweto Gospel Choir, Nina Simone, Kirk Franklin, and Moses Hogan. Under the artistic vision & skillful direction of Dustin Willetts and accompanied by our pianist, Kristy Gill, we are excited to also be joined by the always amazing Atlantics as well as the fullness of a horn and string section. Don’t miss what promises to be a stellar winter concert, Choosing JOY – a Soul Journey. 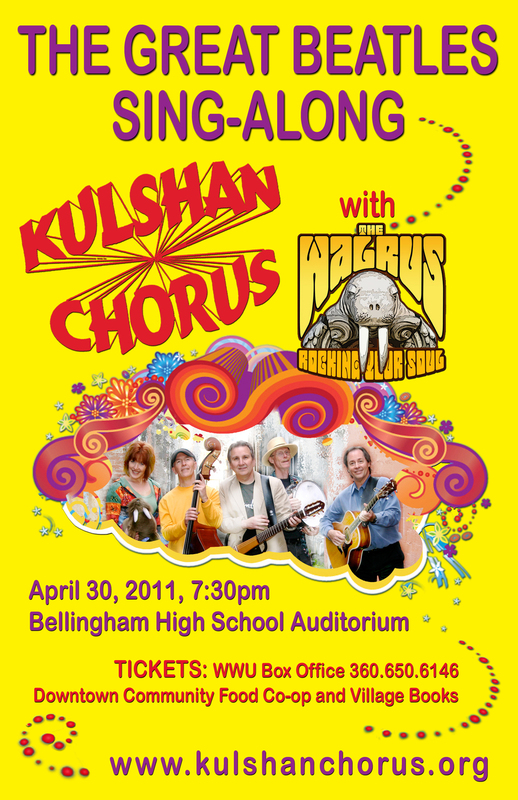 Join The Kulshan Chorus as they celebrate their 30th year! This spring concert bursts forth diving deep into the life-sustaining element of water. Under the inspirational direction of Dustin Willetts, Kulshan Chorus attunes to the many roles of water, bringing the varied facets to life through song; the longing, the danger, the beauty and the serenity. A concert guaranteed to quench your desire for quality choral music. Please join us for a winter performance that will weave a tapestry of both light and darkness. This season’s repertoire was carefully selected by Dustin Willetts to explore both literal and figurative interpretations of light, with the awareness that any conversation about light must also include darkness, blackness, and loss. As with any Kulshan Chorus concert, you should be prepared to go on an emotional journey; you’ll certainly be entertained, but we hope you’ll leave inspired to drive out hatred with light and love. For more than three decades, the Kulshan Chorus has produced choral performances inspired by love, peace and justice. As we enter our 30th year of existence, we have become a powerhouse of local talent and have grown to more than 100 singers. Join us as we celebrate the rich history of the Kulshan Chorus through a diverse selection of music from our archives. This concert will reinvent some of our classics, and showcase a number of recent additions brought to the Chorus by Artistic Director, Dustin Willetts. The Choir will be joined by some familiar musicians for a fantastic night of favorites. For nearly three decades, the Kulshan Chorus has been a staple in the Whatcom County community, known for inspiring performances that span both genre and era. 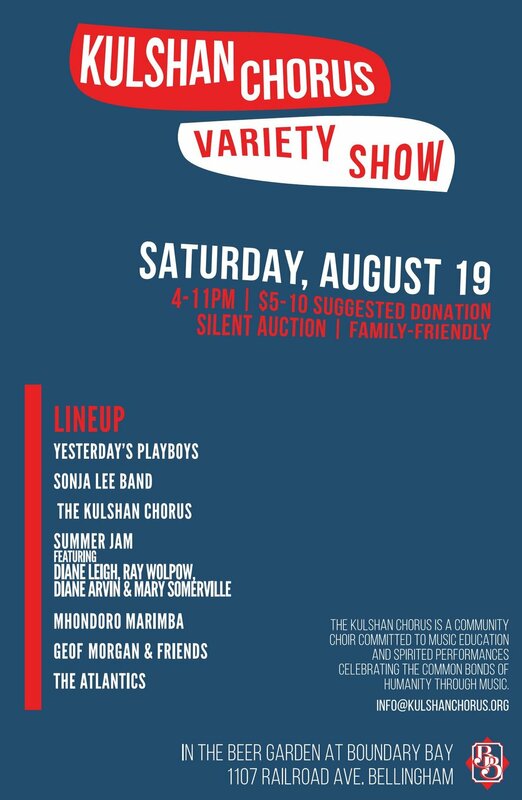 This season, the members of the Kulshan Chorus – all ninety voices – personally invite you to an evening of Greatest Hits. We are honored to perform these songs for our friends and family at home before sharing this music on tour in Croatia and Slovenia this summer. Whether you’ve never missed a concert, or you’re a new fan, this thematically diverse selection of music is some of our best. 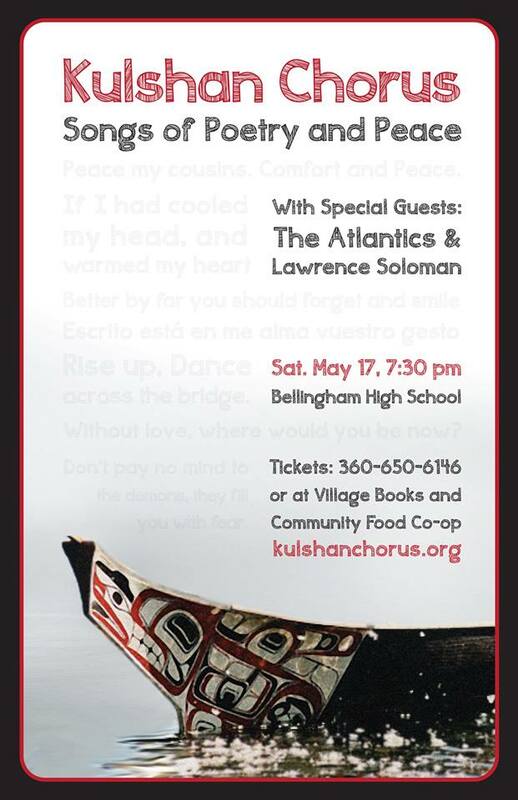 Please join the Kulshan Chorus for a Feast of Songs! This family-friendly performance will warm hearts and inspire year-end cheer. The Chorus will indulge your nostalgia with jazzy winter classics, and surprise you with updated holiday favorites. Come celebrate the spendor of childhood through music and culture, during the most wonderful time of the year! WANDERINGS brings you, the traveler, on a multicultural journey to experience a collective dream. We’ll sail the seas, walk the Gobi Desert, become lost in a wooded wilderness, and reminisce through a tender lullaby. This will be a truly transformative concert, one that will nurture your adventurous spirit. Bring an open heart and an appreciation for the unknown, because through musical wandering, beauty is illuminated uniquely and spectacularly. Join us as we celebrate two remarkable authors. Having sold more than 150 million records, Billy Joel ranks as one of most popular recording artists and respected entertainers in the world. Robert Frost has more choral arrangements set to his texts than any other poet. Both Joel and Frost have captivated us for decades and the Chorus is excited to share a selection of songs that celebrate their contributions to our American culture. We hope you can be there for an unforgettable evening as we embark on a journey to figure out "who started the fire." The Kulshan Chorus is pleased to announce our spring performance, “Poetry and Peace.” Join as we share music that celebrates peace and songs that force us to remember times where peace was not in the hearts of men. They have been working hard all season to produce a concert that celebrates great poetry, where the rhythm of phrases and the cadences of the text take you to a time and place where words are fallen in love with. Songs to brighten the spirit and celebrate the seasons. Our program includes some Kulshan Chorus favorites from years past, some from more recent concerts, and some new tunes. While the songs cover a variety of styles and themes (and centuries), they're united by a commonality of joy: the joyfulness of hope in the face of adversity, the joy found in expressions of faith, the joy inherent in the defiance of oppression, the joy of rocking out to a great beat or making people laugh, and the simple joy of making beautiful music together in community. Description:“Gypsy Jazz” or Manouche Swing, originated in Paris amidst the era in which Josephine Baker and Louis Armstrong were major stars. In the 1920’s, as recordings of American jazz became available in Europe, many of those playing banjos in dance halls, traded them for guitars and began to play jazz, Parisian style. Since many of the finest musicians had roots among the manouche or gypsy tribes, the odd, "Eastern" sounding scales that give the swing-era musette its trademark exotic sound crept into the musical arrangements. Among the famous was gypsy guitarist, Django Reinhardt, who, along with virtuouso violinist, Stephane Grapelli, fronted the Quintette du Hot Club de France in Paris in the 1930’s. Description: SuperSones play the sublime music known as Son - the acoustic dance music of the Cuban countryside that inspired modern Salsa. Son is a unique blend of Spanish guitars and harmony, Afro- Cuban percussion and swing, call-and-response singing, and trumpet improvisation. From the 1930’s in Havana to the present moment, Cuban septets like SuperSones have inspired people around the world to dance and celebrate. SuperSones represent this rich musical tradition with a wide range of classic and original songs in the many genres within the Son family: bolero, cha cha chá, guaracha, and son montuno among others. Description: A huge gospel and soul concert! Enjoy a musical celebration where you can experience the full power and energy of the Kulshan Chorus with songs by Ray Charles, Paul Simon, Edwin Hawkins, Sweet Honey on the Rock, The Fairfield Four, and many more of the finest gospel composers and arrangers. A concert you won’t want to miss. Bring your family and friends to a show that will “shake the rafters.” You won’t be disappointed!!!!" Description: "Pause for a moment to remember these words: "It was twenty years ago today ..."
It's the Beatles, of course, from "Sgt. Pepper's Lonely Hearts Club Band," an album that came out more than four decades ago, in 1967. The Fab Four officially disbanded just three years later, yet their music remains as energetic and dear as the grown children of boomer parents who screamed when they first saw the Beatles on "The Ed Sullivan Show." Their enduring popularity is one reason the upcoming Beatles singalong presented by Kulshan Chorus and The Walrus rock band is expected to be a sellout. A concert of Irish, Scottish and English music reflecting the rich heritage of the Celtic tradition. From ballads of drama and longing of the sould to energetic jigs and boisterous pub chanties. Description: The Kulshan Chorus is pleased to present a musical version of “comfort food” – favorite songs drawn from the Kulshan Chorus repertoire of the last 20 years. We offer you a diverse program of tunes spanning many genres, from doo-wop to power pop, Motown to Cape Town, French café to gospel mainstay. These are songs we love to sing; they’re joyous, uplifting, and just plain fun. 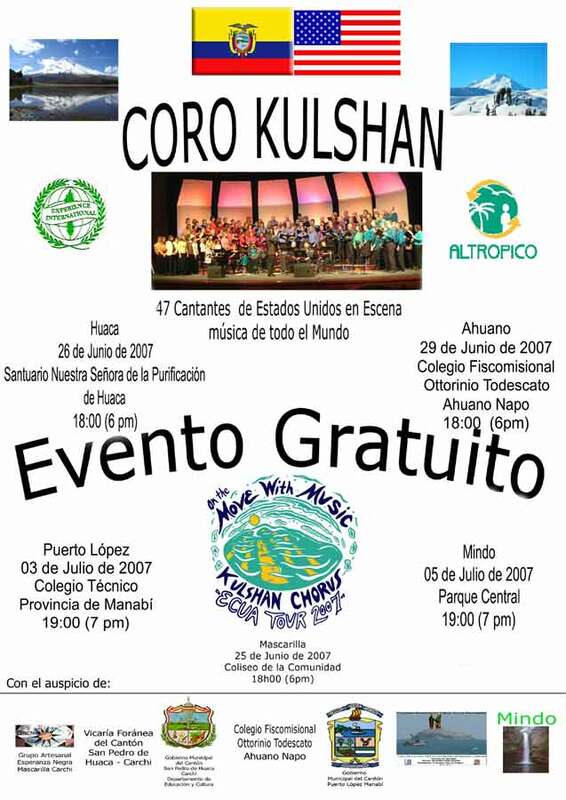 Description: This year, the Kulshan Chorus will join “The Atlantics” in tribute to Tom Hunter. Tom was a superb storyteller, a minister, mentor, musician, inspiring in others to make a positive difference in the world by giving and believing in one’s self. We invite you to share this concert, a colorful and powerful celebration of giving, caring and “Heart & Soul.” That’s what Tom was all about. Description: A concert of World Music – a collection of musical jewels designed to add sparkle and zest to your life by making this celebration a part of the mid-winter holiday. Our concert features songs by Bob Dylan, The Beatles, Argentine chanteuse Mercedes Sosa, Aretha Franklin, Elton John, Keb Mo and many others including local songwriter Linda Allen. Issues of diversity, community, and peace are certainly on everyone’s mind these days, not only in our neighborhood, our city, and our country, but globally as well. This season we direct our attention to these concerns. 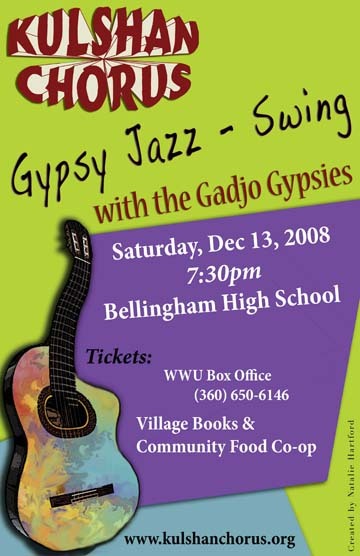 Description: The Gadjo Gypsies join the colorful and powerful 90-voice Kulshan Chorus in a concert of Gypsy jazz, American swing, and French musette, with a touch of klezmer. Gypsy Jazz originated in Paris during the era when Josephine Baker and Louis Armstrong were major stars.